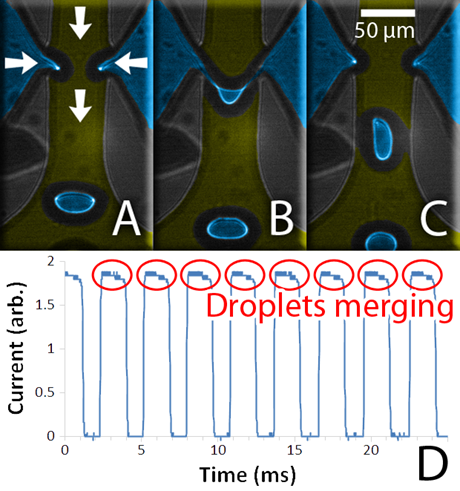 μFluidics Working with droplets? Consider Lariat's novel methods for droplet generation, drop-by-drop injection, and microgel fabrication for your application. We can help you improve performance while reducing instrument costs. μGels Need outstanding microgels? Contact us to discuss our custom size or industrial scale fabrication capabilities. 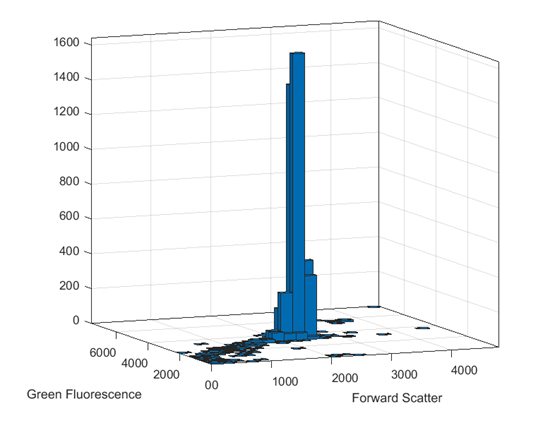 Electronic droplet detection enables real-time monitoring of chip performance, while providing quantitative information about droplet generation. Applying a voltage between the two aqueous channels, via off-chip electrodes in the sample wells, drives an electrical current through the aqueous fluids. 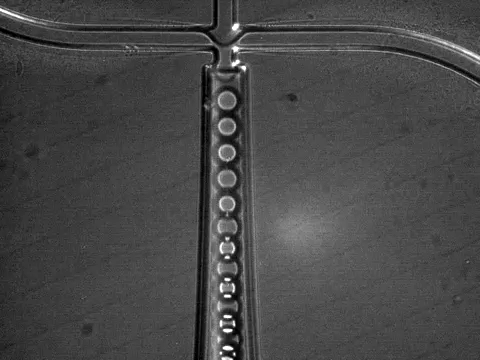 At the intersection, the two aqueous phases form a transient fluidic bridge during droplet generation, temporarily allowing electrical current to flow. However, the bridge is disrupted by the flow of oil after droplet snap-off, cutting off the electrical current. This unique electronic signature is monitored indicating successful droplet generation and revealing important characteristics like the generation frequency. In detail, in the figure to the right, white arrows indicate the direction of flow and the false-colored blue and yellow fluids are aqueous and oil, respectively. In panel A, two boluses of aqueous fluid protrude into the intersection under the normal course of flow, but also “reaching” out to each other under the Coulombic influence of the applied electrical current. Eventually they bridge the gap in panel B, and then subsequently fluidic strain dominates over the electrical current and a droplet snaps off in panel C with mixed contents from each aqueous stream. Not shown, in the absence of electrical current the aqueous boluses alternate entering the intersection, never forming a bridge nor creating droplets with mixed contents from both aqueous streams. Thus the electrical current serves both to drive fluidic mixing at the intersection and to provide a means for monitoring droplet generation. Panel D shows the bursts of electrical current indicating individual droplet generation events. Lariat has invented a novel, ultra-stable microdroplet generator that is immune to large variations in drive conditions. This is achieved with a "ledge" feature just downstream from the bridge-mode droplet generating intersection. At the ledge, the droplets traveling downstream experience a sudden increase in channel depth. Over the ledge, surface tension abruptly dominates over the other influences of electrical continuity and fluid strain. As long as the same ratio of aqueous and oil flow rates is maintained, then the surface tension effect delivers uniform droplet volumes. 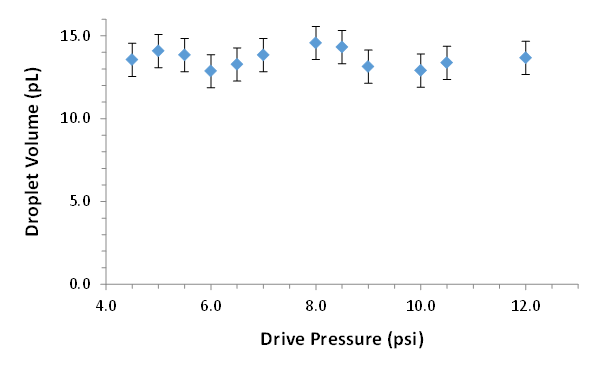 However, unlike certain other step-mode droplet generators, the droplet volume in Lariat’s device can be tuned by varying the aqueous-to-oil ratio. Maintaining a constant aqueous-to-oil ratio is as easy as applying the same pressure to each fluidic inlet. 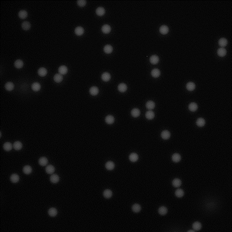 Lariat has combined our proprietary electronic detection and robust droplet generation to synthesize functionalized microgels. Our microgels are exceptionally uniform in size and composition and are highly monodisperse. Representative DNA-functionalized polyacrylamide microgels are shown in the figures below. Please contact us to discuss your microgel application. Lariat was recently awarded patent US 10,105,702 for bridge-mode droplet generation, manipulation, and electrical detection. Lariat also has a number of other patents pending related to both microfluidics and genotyping. Please contact us for licensing, collaborating, partnering, or consulting opportunities for your application.